A soft voice slowed me as I rushed past at last weekend’s first Washington Open Baduk Championship, which was organized by Allan Abramson, Gary Smith, Todd Heidenreich, Andy Okun and myself. I turned to see Shin Kang, who embraced me like an old friend. Mr. Kang, of Ellicott City, Maryland, was the hero of Baltimore go players when I began playing back in the 1980′s, and I was extremely honored and touched that he recalled me from our few meetings over the years. Shin Kang (at left in photo) was the highest-rated player in the U.S. during the late 1970s, above even the legendary Takeo Matsuda of New York, and Young Paeng of Pittsburgh, an old rival he asked about on Sunday. Kang was the Eastern Champion, or “Honinbo” from 1976 to 1978 and won the Maryland Open for its first 5 years, 1974 to 1978, and again in 1980. He lost in the phone relay US Championship to Kyung Kim of San Francisco in 1976, and, for the most part, paid his own way to get out to San Francisco in 1977 to try again face-to-face, but once again was defeated by Mr. Kim; their games were commented on by no less a luminary than Haruyama 9 dan. Meanwhile, he sponsored a teaching tour by Kim In 8P, and was top board in a telex match with Taipei. In 1978, JAL sponsored the U.S. Championship in New York, but Mr. Kang’s opponent was not Mr. Kim but Shigeo Matsuhara of Los Angeles. Mr. Matsuhara’s victory in the Western Championship was considered quite an upset; after all, he had been defeated that year in the Los Angelos Open by a fifteen-year-old kid named Michael Redmond. Mr. Kang won two straight games to become US Champion, and went on to represent the US in the first World Amateur Go Championship, along with Mr. Matsuhara, Mr. Kim and team captain Richard Dolen. Sadly for us, work pushed tournament go out Mr. Kang’s life for many years. Now retired, we can only hope we will see more of the 66-year-old former importer and wholesaler. Kang won his first game at last weekend’s first Washington Open Baduk Championship, lost his second, but then won rounds 3 and 4 and I was excited to see him on board 2 for the final round. I was ecstatic when a re-pairing put him on Board One against the undefeated Andy Liu (at right in photo). I showed E-Journal Managing Editor — and Board 1 game recorder — Chris Garlock a listing on my IPad of Kang’s impressive Maryland Open record as Andy walked by, took a look and softly exclaimed “Oh, wow!” at the record of his fellow Maryland Open champion so many years before his birth. Mr. Kang greeted Andy with a combination of respect, fellowship and, I think, pride, in his role in bringing American go to a place where this young man could sit across from him, “So, you are the pro,” he smiled. “I look forward to receiving a good lesson.” Liu 1p respectfully but strongly responded “We are equals here.” It was a wonderful moment, one of the first generation of great American go players, enjoying the chance to see what has grown from the seeds he planted, and today’s pioneer, recognizing and appreciating their shared and ongoing journey. Mingjiu Jiang 7P will lead a Summer Go Day Camp July 7-11 in Mountain View, CA. 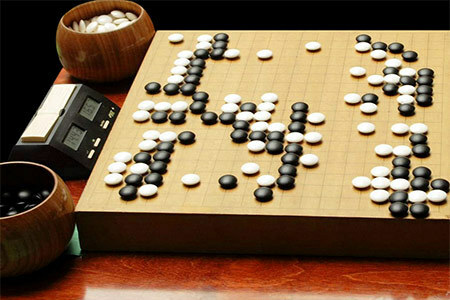 Attendance is limited to “All interested in go,” with 16 places available, at $300 each. The camp will run 10a-5p daily; lunch and snacks are included. Email mingjiu7p@hotmail.com for more info or click here for a registration form; registration form and checks must be sent in before May 31 to: Mingjiu Jiang, 1289 Lane Ave. Mountain View, CA 94040. A new season of American Yunguseng Dojang (AYD) starts on May 5. This will be the second season in American time zones, the ninth season in Europe, for the internet go school from top-rated European player, Korean-born Hwang Inseong 8d (below, reviewing). About 20 students, from 12k to 3d, are already signed up for AYD but there is still plenty of room for more. About 70% are in the United States, with others in Canada, Mexico, Chile and Peru. The program consists of interactive online lectures, student league-play and game reviews on KGS. Students have access to all past lectures and reviews, including those from the European sister-school. In addition, this season Hwang is introducing “personal go reports” to help students assess the progress they are making and the areas which need most work. Each student will receive a report after the first three months and every six months thereafter. Click here to see an imaginary sample report in Hwang’s posting on lifein19x19. This year’s cake was decorated with Junior Mints and Mentos (right), and is pictured with three longtime veterans. Kellin Pelrine 6d (left) first came to the club when he was 11. Now 18, he gives stones to almost everyone at club. Matthew Harwit 5d (in red) and his twin brother Nathan 4d (in green) both started around the age of 8. Many kids have come and gone over the years, and the club has at times attracted as many as 30 players in a given session. Twenty-year-old Israeli Ali Jabarin 6d (right) is leading the field at the end of the second series of online training leagues for the upcoming competition to qualify two players as the first European Go Professionals (see European Go Federation and CEGO Launch Online Training for Pro Students – 4/1 EJ). Thirteen players have been competing in two online leagues and the A-league of the second series of five ended as scheduled last Friday, April 25, with Jabarin (“OohAah”) winning four out of five games, losing only to CEGO teacher Zhao Baolong 2P. Austrian Viktor Lin 6d (“Sandmann”) and Slovakian Pavol Lisy 7d (“cheater”) were demoted to the B-league, to be replaced by promoted Romanian Cornel Burzo 6d (“Cornel”) and Serbian Dusan Mitic 6d (“shinobi90″). Lisy is in fact temporarily withdrawing from training to devote himself to studying for his high school final exams. The B-league was not decided until Sunday April 27, as many players, along with teacher Zhao Baolong, attended the Korean Ambassador Cup 2014, 43rd Prague Go Tournament at the weekend. All the training games are played in a public room, ”Euro Dream Team” on KGS, default start-time 20:00 CEST, and European Go Federation (EGF) Secretary Lorenz Trippel, who manages the leagues, has noted up to 400 spectators watching the games at one time, and 100 – 200 typical. The fourth series ends on May 21 and the double knockout qualification competition kicks off with the 1st round CEGO Pro Qualification on May 23 at the Strasbourg Tournament. Then at the Amsterdam Tournament, on May 29, the 2nd round CEGO Pro Qualification will see a player with four straight wins (two games per round) certified as the first ever European Professional. Finally, after a fifth training series May 2-13 and a “Power-week” of special teaching June 16-20, those with only one loss will compete in the 3rd Round CEGO Pro Qualification at the Vienna Tournament, running June 20-22, to select a second European Professional. Click here for full details, including league tables, player profiles, game records and more. The American Go Foundation (AGF) is offering $200 youth scholarships to this year’s US Go Congress. Interested youth must write an essay on why they want to go; the application deadline is May 30th. Twenty-Five scholarships are available, and up to 15 awardees will be selected by June 1. Five scholarships are available to residents of Canada or Mexico. Applications received after May 30th will be placed in a lottery with the remaining scholarships awarded at random from qualifying essays. The scholarships are available for youth who are under 18. For more information, and to apply, click here. – Story and photo by Paul Barchilon, E-J Youth Editor. Photo: Calvin Sun 7d plays Lionel Zhang 6d, in the Youth Room at the 2013 Congress. Andy Liu 1P took the first Washington Open Baduk Championship with a 5-0 sweep on April 26-27. Displaying his customary sharp and speedy play — rarely using more than half the 60-minute basic time — Liu dominated his opponents, winning most of his games by resignation. The young American pro was characteristically modest, however. When retiree Kang Shin 7D, a powerhouse who won multiple titles in the 1970′s, cheerfully told Liu “You’ll give me a lesson” as they sat down to play in the final round, Liu quietly replied, “We’re all equals here.” Organizers were pleased with the turnout and the venue at the Korean U.S. Science Cooperation Center in Vienna, VA, as well as the addition of a new major East Coast tournament to the annual go calendar. “We’re especially grateful to Scorpion Sports, the Korean Embassy, the Korea Amateur Baduk Association and all the volunteers and sponsoring organizations who put on this great event,” said AGA President Andy Okun. Allan Abramson directed, with Todd Heidenreich assisting. Attendance at the Vermont Spring Go Tournament ”was sparse, with just 9 players,” reports organizer Peter Schumer, “but everyone brought their ‘A’ game and made for a fun and exciting day.” The event was held on campus at Middlebury College on Saturday, April 26. Prizes were awarded to the top four finishers plus two “fighting spirit” awards “to those whose results might have seemed disappointing,” adds Schumer. The top finishers were: 1st: Milan Mladenovic 7k (3-0); 2nd: David Felcan 2d (2-1); 3rd: Daniel Steinbrook 3k (2-1). Quizmaster Learns Something: Half of you came up with 15, the correct answer, although Steve Burrall insists there are 16, but only listed 13 in his comments. Here’s Grant Kerr’s list, in a rare moment of only almost correctness, in order of their proness. Your quizmaster did not know that Francis Meyer (left) of North Carolina had made pro in February, but sorry Grant, it is with the Kansai Kiin, not Korea. Congrats to this week’s winner, Robert Tirak of The Dalles, OR, chosen at random from among those answering correctly. This Week’s Quiz: It’s time to make your plans to go to the 2014 U.S. Go Congress, the nation’s biggest go event of the year in its biggest location ever, New York City! Your challenge this week is historical: New York City joins San Francisco, Chicago and Seattle as the fourth US city to hold a Go Congress and what other noteworthy historic event? Click here to submit your best guess; as usual, points will be given for creative answers.